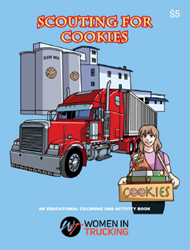 Women In Trucking Association, Inc. launches new supply chain activity book “Scouting for Cookies” to engage children with the trucking industry at a young age. This release applies to women, trucking, transportation, logistics, supply chain, gender diversity. "We want them to have a personal connection with that truck on the road and how it relates to their own snack. It’s fun and educational and something everyone in supply chain can use to teach children about careers in the transportation industry,"
Women In Trucking Association (WIT) is excited to announce “Scouting for Cookies,” a new activity and coloring book for children. The purpose of the book is to engage children with the trucking industry at a young age. In the activity book, the reader follows a young girl, Adelynn, through the supply chain to understand where cookies come from. She learns how often a truck is used to move goods throughout the supply chain. Activities in the book include coloring, drawing, word search, math, geography and much more! For more information about the activity book or Girl Scout (Guide) events, please contact Lana(at)WomenInTrucking(dot)org.